The Solar Energy Industries Association last week made public a national poll that found strong citizen support for adding the energy of the sun to the nation’s portfolio. The timing of the results was meant to coincide with the Federal government’s review of big solar thermal projects proposed on public lands in the West. The poll, though, masks another emerging clean energy trend in the desert. A good number of citizen activist groups are pushing hard to stop solar development, as they’ve done for wind projects around the country, and other clean energy development. How much influence could such protests generate? A lot. A year ago, the Bureau of Land Management, a unit of the Interior Department, received 199 applications for industrial-scale solar plants that would take up 1.7 million acres in the desert Southwest. Solar Millennium, Optisolar and Chevron Energy Partners, among others, filed requests for nearly 1 million acres of land in California alone, the vast majority of it in the Mojave. The 2005 Energy Policy Act calls for generating 10,000 megawatts of renewable energy on public lands by 2015. Four days before the Bush administration left office in January 2009, Interior Secretary Dirk Kempthorne authorized the BLM to create renewable energy offices in Wyoming, Arizona, California and Nevada. The offices are meant to speed permitting for wind, solar, biomass and geothermal projects, as well as transmission lines. “To knowingly run out and destroy pristine habitat in the name of saving the environment is ludicrous,” April Sall, the conservation director for the Wildlands Conservancy, told the Denver Post in September. BrightSource Energy certainly got that message. Last September BrightSource canceled a solar thermal project in the Broadwell Dry Lake region of the Mojave, joining Tessera Solar, which also canceled its plan to develop a 5,000-acre solar-thermal site nearby. Both plants faced significant citizen opposition and would have encountered even more because they would be located in the 941,000-acre Mojave Trails National Monument that Senator Dianne Feinstein has proposed. In all, 17 big solar thermal projects and a half dozen big wind projects proposed for the area have been halted by the proposed monument, which would link Joshua Tree National Park and Mojave National Preserve. Clean energy developers are surprised by the push back. “I got into this business because I feel it’s the right thing to do for the future of this country,” said Paul Whitworth, co- founder of Lightsource Renewables, a company that has already put one solar project on the back burner because of a combination of lack of transmission capacity and Feinstein’s national monument proposal. 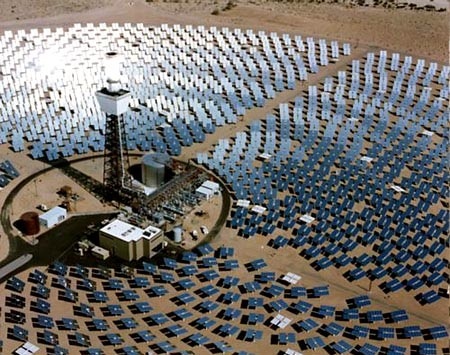 In February, BrightSource made another move to quell public concern by announcing it would reduce the size of a proposed 400-megawatt solar thermal power plant that it initially said would cover five square miles of the Mojave. The new plan calls for reducing the area needed for the plant 12 percent. Reason: the company said it wanted to protect the habitat of the endangered desert tortoise. The cord tying the solar development together was a 500-kilovolt $500 million transmission line that would have cut through Johnson Valley on its way to Los Angeles. Citizen opposition to the line was a big reason that Los Angeles city officials halted the proposal this month. The 85-mile project was criticized by conservationists because it would have cut through two wildlife preserves and the San Bernardino National Forest. David Myers, the executive director of the Wildlands Conservancy, said better routes were available, including using existing transmission corridors. “The bottom line was it was an ill-conceived project,” Myers told Reuters. The competiton between wild lands and clean energy is dividing the environmental community in California, especially the Sierra Club. Last week California Governor Arnold Schwarzenegger held a conference on renewable energy. Carl Zichella, one of the organization’s renewable energy experts, asserted that climate change jeopardizes many desert plants and animals that live at higher altitudes. Reaching the necessary emissions reductions can’t be achieved only through installing rooftop solar systems and conserving energy, he said. “No matter how we look at it, we need large-scale energy development,” Zichella said. But Joan Taylor, of the Sierra Club’s Nevada and California desert committee, said many energy projects now moving forward would be on pristine, publicly owned land. She suggested building clean energy projects on private lands that have already been disturbed. “The disturbed-land alternative can be embraced by environmentalists and communities,” Taylor said. More on opposition to transmission lines comes next.